Comparing the Confraternity and the Rheims NT is a good idea, but you should add the NABRE NT also. It seems when the NAB editors revised the NT in the 1980s, they incorporated many aspects of the Confraternity. Using the word "Magi" instead of "Wise men" (or "Astrologers", as the original NAB NT had) comes to mind. Also, "amen amen I say to you". I would dare say the current NABRE NT seems like a revision of the Confraternity rather than the original NAB NT. I am interested in why you think that the Confraternity NT is "under-appreciated." I certainly can understand those who are fond of the Confraternity NT because they grew up with it. And I have a few copies kicking around. But as far as I can tell from contemporary accounts, it was not well loved by most readers during its brief lifetime. Certainly, it did not help that the Confraternity NT was effectively rendered deficient within two years of its publication by Divino Afflante Spiritu's focus on original languages. The Confraternity NT is less fluid than the Knox NT (and in a way less accurate, since Knox referred heavily to the Greek), and it is less true to the Latin than both the original Rheims NT and the Challoner-Rheims NT. All of these are in print, and there are also a number of Latin-English diglot New Testaments available. 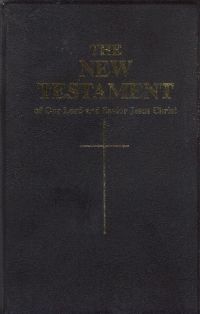 Sure, the Confraternity NT is available some elegant printed editions, but that it is because it is a NT -- since the NT is relatively brief (about a third the size of the Catholic OT), the text that can be conveniently printed in a single volume. Quite a few NT-only volumes are similarly elegant. With the exception of those who grew up with it, I could not recommend the Confraternity NT as a first or even second NT translation -- even for those who are seeking a translation of the Vulgate NT. Perhaps I could have described it rather as 'forgotten'. Many people remember the DR and then skip to the JB or NAB when talking about Catholic Bibles. Present company excluded of course!